In January 2012 I built two closed-cell foam SASS units for Audio Technica 4022s and for Sennheiser MKH 8020s microphones. The idea is that, apart from having good stereo sound and being very lightweight, the foam itself provides a very secure mounting for the mics. The pictures should be fairly self-explanatory. Dimensions are about the same as for the Crown SASS but with narrower nose. 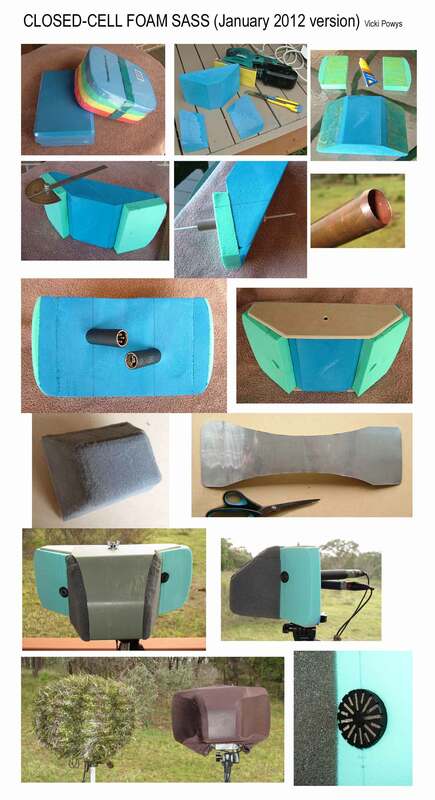 Yoga block and kids’ floaties were used for the closed-cell foam body, grey high density open-cell foam for the nose, thin aluminium sheeting for the wrap around cover, mdf board for top and bottom, 1/4 inch threaded rod and wing nuts to secure the unit to tripod. For the mic holes I measured up then drilled pilot holes with 1/8 inch drill to get the angle exactly right, then inserted a thin knitting needle which gave me the line for hand-twist cutting of the hole with a sharpened piece of 3/4 inch copper pipe. Both the AT4022s and the MKH8020s then fitted snugly with some gentle pressure, and the unit also protects the mics from moisture and sudden temperature changes, and absorbs any jolting movements when carrying the unit in the field. I allowed plenty of room between the two AT4022s as I found that if they are touching one another they may make popping noises. In the foam SASS, they seem immune. I have left the foam unpainted at this stage. The windshield comprises 2 stages, a. lycra and b. furry knitted cover. The 4022s do stick out a fair way at the back, but the 8020s are contained wholly within the solid-foam body. Below is an mp3 sound sample of the 4022s in this rig, pre-dawn near my home, recorded 8 January 2012 with a Sound Devices 702 recorder. 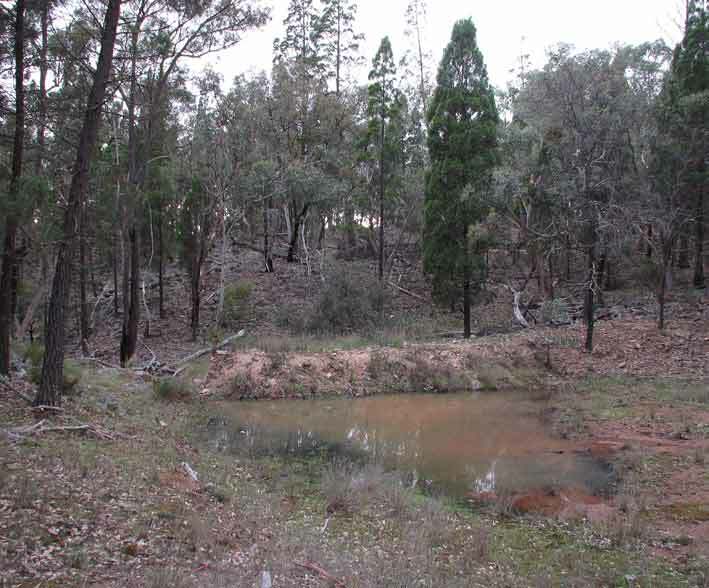 The main callers are Yellow-faced Honeyeaters as seen in this picture. Also heard are Superb Fairywrens, Noisy Friarbirds, Laughing Kookaburras, Rufous Whistler, Eastern Yellow Robin, a wallaby hopping, and a distant Barking Owl. 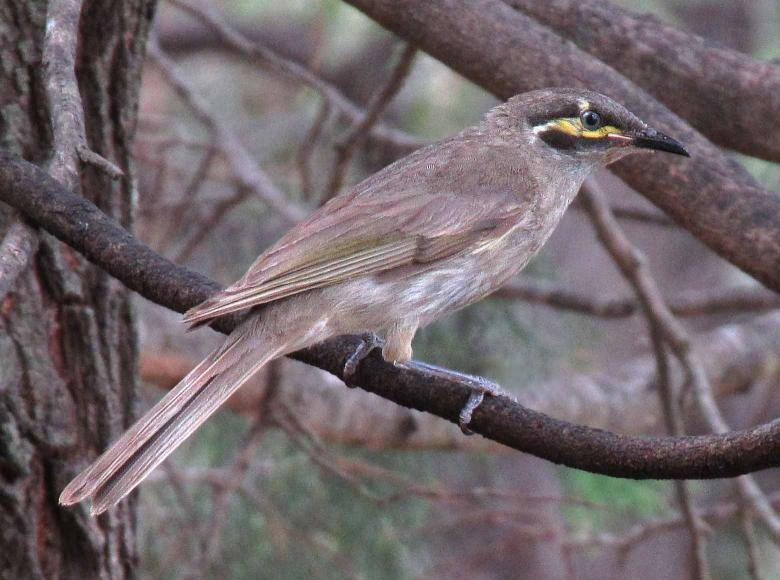 AUDIO: Yellow-faced Honeyeater at dawn 8 January 2012, AT4022s in DIY foam SASS to SD702 recorder. 5 minute sequence – no filtering or EQ. 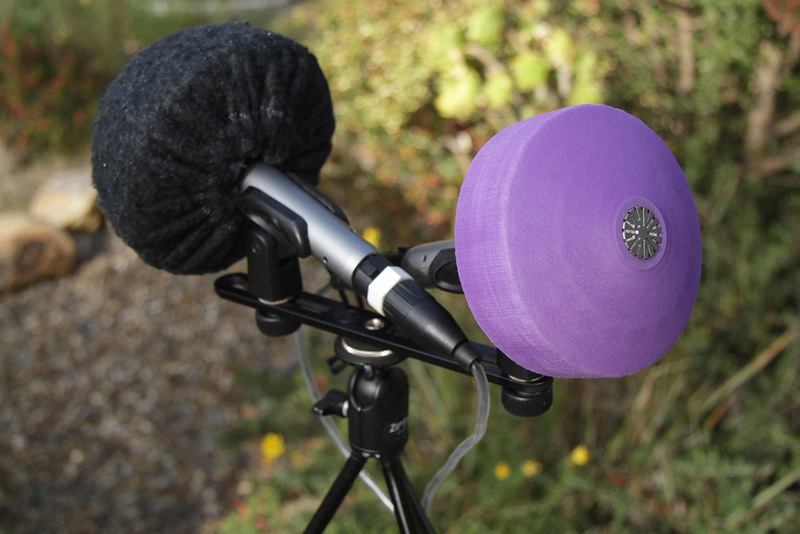 Next up is an mp3 sound sample of two MKH 8020 mics in the DIY SASS rig, recorded 4 February, 2012. Three species of frogs were all calling together, then all stopping together, on a moonlit night after rain, at a puddle of water in dry woodland habitat, Capertee Valley, NSW, Australia. First you hear Eastern Brown Froglet Crinia signifera with its persistent ‘crik-crik-crik’, then some Ornate Burrowing Frogs Limnodynastes ornatus join in with intermittent ‘unk’ calls. Then Green Tree Frogs Litoria caerulea, with ‘crawk-crawk-crawk’. 23 degrees C, 60% humidity, 4 Feb 2012, 3/4 moon, part overcast, 10:45 pm DST. SD702 recorder, 2 x MKH 8020 mics in DIY SASS rig. AUDIO: MKH 8020s in DIY SASS to SD 702 recorder. Frogs – no filtering or EQ, 4:14 minutes. Since writing my 4 pages on DIY recording gear in 2011-12, I have compared notes with fellow recordist Andrew Skeoch in 2017. Andrew has also been experimenting with DIY rigs and has come up with the PIBO – pair of independently baffled omnis – to make the best of 360 degree recording situations. It is a good rig, says Andrew, for leaving in the jungle when you don’t know from which direction the calls may come! Here is a picture of Andrew’s yoga-block baffle (with a pair of Audio Technica 3032 mics set at 180 degrees). There is more information with sample recordings on Andrew’s website, here and here. This page was originally written in 2012 and last updated 2 June 2017.